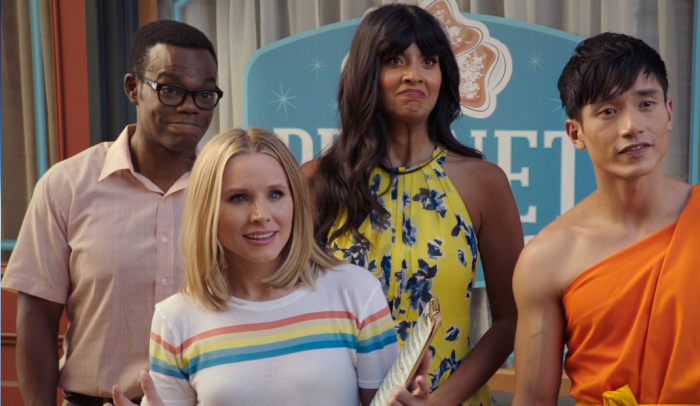 The season finale of The Good Place brought laughter and throwbacks but it was emotional too! Here's a recap!! With Michael freaking out with nerves, Eleanor decides to take on his job and welcome the new member, John Wheton, of The Good Place. She takes him around The Good Place and had Janet give him the full tour; while she discusses with Chidi and others about still following the plan expect she will introduce the new people coming in. But there's just one problem; Sean had chosen two out of the four to be those that will cause Eleanor and the gang trouble. One of them John Wheaton, who happens to knows Tahani and her history. While the other person happens to be Simone! Michael confronts the Judge and Sean about this and as much as she could change it; Judge decides to let Michael choose the final two residents and allow him to wipe Simone's memory of Chidi and everyone from Soul Squad she knows. But Chidi couldn't let that be and decides that the only solution would be rebooting him (again). As Eleanor and Michael don't want to do that, they know it's for the best and go for it. But after a few hours of being alone with each other, Michael gives Eleanor and Chidi a movie of their memories together through the many, many reboots in The Good Place. After the Michael reboots Chidi, Eleanor discusses with Janet the meaning of life and relationships. But Janet comforts her with what she has learned from being in love with Jason and all and Eleanor replies that Janet would make a really good girlfriend. The season finale of The Good Place might not have been as shocking as season one's finale, but it still held on its own. It was strong with it's writing and kind of gave us what to look forward to in Season 4 Not only was I laughing and on the edge of my seat at times because of the moment Sean's trick. There were many moments that were like a recap throughout the three seasons like Jeremy Bearimy and etc. But this episode really showed its emotional moment with Chidi and Eleanor, who I think are the best television couples. And not to mention the moment between Janet and Eleanor was also a memorable one as well. Janet has really come through this season. I really much enjoyed this season, like the previous season; it had those moments that the Good Place has shown but moments that really had me going oh my god in a way. I would go on the limb and say that this season is worthy of winning some awards with the writing and performances. I think in Season 4 we'll jump to the moment where Eleanor talks to Chidi and shows him around. Tahani would probably try to become best friends with John. Jason and Janet would try to get their relationship going. But the big question is who's gonna be the next two people coming to The Good Place? Donkey Doug? Pill Boy? Overall, I give this episode a 9/10 and this season a 9.5/10. What did you think of the season finale? What did you think of Season 3? Any predictions of Season 4? Leave a comment! You can catch The Good Place available to watch on NBC.com, NBC app, and On Demand.